Melbourne’s White Night has gone from strength to strength since it's inception in 2013. For one night in February, hundreds of thousands of people cram the CBD from 7pm until 7am to enjoy all our fantastic city has to offer under the moon. Trying to take kids to this cultural sensation can be a bit intimidating – so we’ve got some tips and tricks to make sure the whole family has a great time. Organisers suggest that peak time will be from 7pm until 11pm – so take a Saturday afternoon power nap and aim to get into the CBD any time from midnight onwards for a bit more breathing space. If you’re dead set on getting in early, remember that many of the light projections don’t start up until 9pm. Water taps are available, but it’s going to be a hot one and every man and his dog will need a drink – so grab a spare water bottle or two to avoid spending your night caught in a queue! Melbourne’s public transport will run all night, with trains and trams being your best option. Several parking operators in the city are also doing special pre-booked deals for patrons driving into the CBD, which may be better for families with young children than trying to wrangle them on a packed tram. Be aware, driving in the CBD could be hectic! It’s going to be hot, with the temperatures estimated to stay in the mid to high twenties all night. 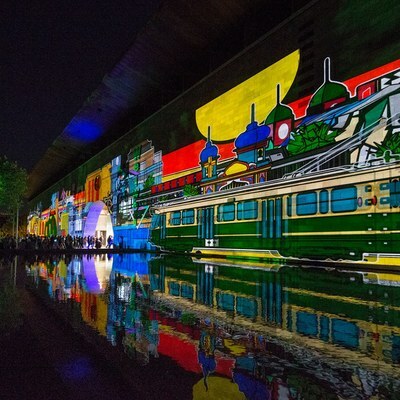 White Night this year stretches from the National Gallery of Victoria in St Kilda Road in the south to the Melbourne Museum in the North and from Elizabeth Street in the west to Russell Street in the east – and through Birrarung Marr too. With so much to see and do, wearing comfy shoes that will see you through all night is an absolute must! Are you heading into White Night? What are your best tips for getting the most out of your night?